Ontario Health Coalition holding hearings across Ontario this month in advance of next year’s provincial election. 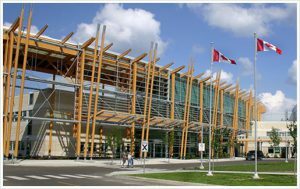 Thunder Bay Regional Health Sciences Centre (FILE). THUNDER BAY – The public is being asked for feedback on local hospitals. The Ontario Health Coalition will hold public sessions across the province throughout the month of October seeking input and stories about their experience with hospital health care, a move designed to generate public debate over changes needed to improve public hospital services. Thunder Bay’s scheduled hearing will be held on Thursday, Oct. 12 at the Italian Cultural Centre, the lone Northwestern Ontario date. The OHC say it is contacted daily by people with stories and ideas to make improvements to hospitals. “The stories run the gamut from life-affirming to heartbreaking,” the OHC says in a release issued on Friday. The goal, says the OHC, is to create a platform of progressive reform headed into next year’s scheduled provincial elections to address under-capacity, cuts, privatization and overcrowding. “Ontario has had the worst hospital cuts in the country: we have the lowest hospital funding levels, the fewest hospital beds per population, the least nursing care per patient, and we have seen massive cuts to clinics and outpatient services as well. Public hearings will also be held in Welland, St. Catharines, Ottawa, Trenton, Toronto, Scarborough, Chatham, Wallaceburg, North Bay, Woodstock, Hamilton, London, Windsor and Durham/Ajax.